Movist Pro is released now. You can use many features that were not available in the App Store version. If you have already purchased from the App Store, you can upgrade for free. Now meet the new Movist. macOS 10.10 or later required. The controllers are practical and convenient, as well as appearing only when the mouse pointer is approaching. Transparent title-bar and controllers allow you to focus more on your watching experience. The main menu displays various states in real time, and the control panel gives you quick access to all the functions you need. Move the mouse over the seek-slider to see the thumbnails. In addition to all these conveniences, we have added beauty. 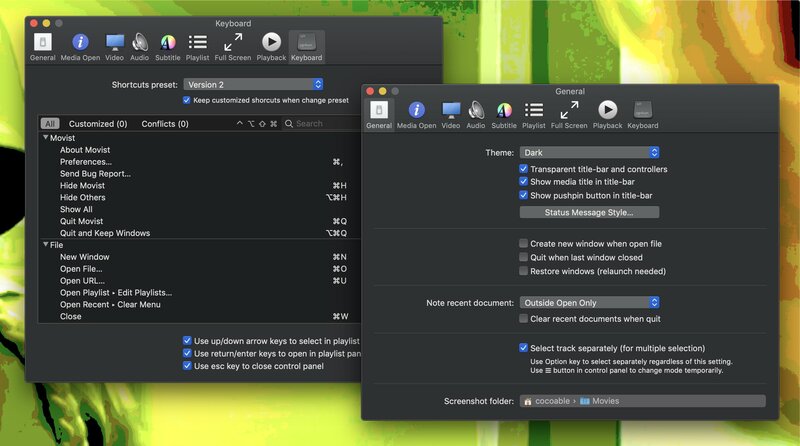 It supports modern style of macOS including light and dark themes. This browser does not support video. 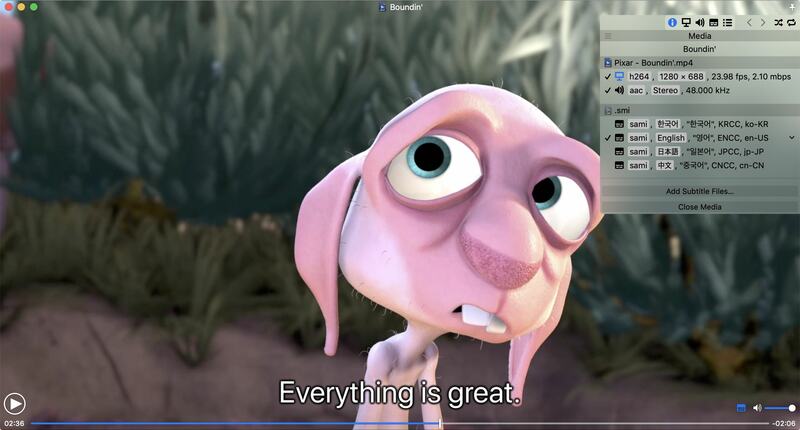 Movist supports hardware accelerated decoding of H.265/HEVC codec. You can enjoy 4K UHD images comfortably. Also, it is optimized to consume minimum energy. CPU Usage has been cut in half. You can watch the videos included in the web page with Movist. You can of course enter the internet address manually or drag the internet link. You can choose the quality, see the subtitles, and use all Movist functions. You can add it to your playlist, and you can open it again from recently opened list. Now, you just have to look at the Internet video conveniently. There are many default preferences to apply when you open a media. You can specify the default track language. you can set not to display subtitles if there's an English audio track. You can specify your preferred video quality, filters, equalizer, etc. You can also restore the last time you played it to watch from there. 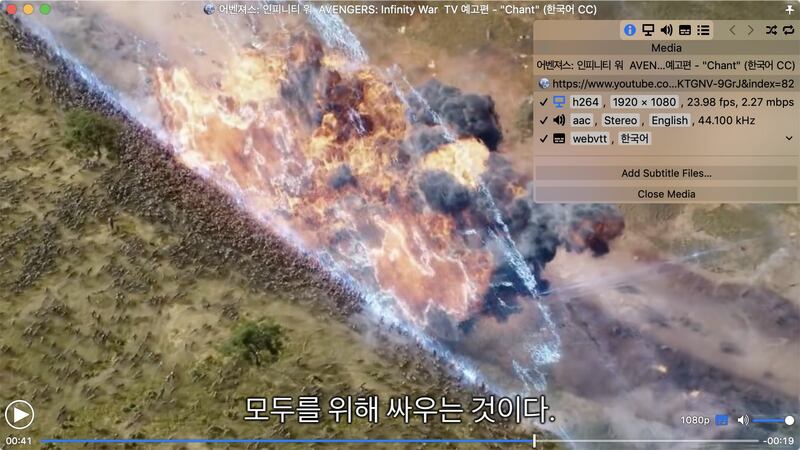 You can view subtitles in multiple languages at the same time. You can also set the different location and style for each languages. You can also select multiple tracks simultaneously for video and audio. For example, if the front and rear videos of the car black box are contained in one file, you can see the front and back videos at the same time. Movist will display subtitles in the letterbox space if possible. The subtitles not only mask the video but also improve visibility. so that the subtitles are laid out in line units. You can also set the number of lines to be displayed in the letterbox. Please, do not waste letterbox space. Movist can read the subtitles aloud. If you have trouble seeing the subtitles, listen now. 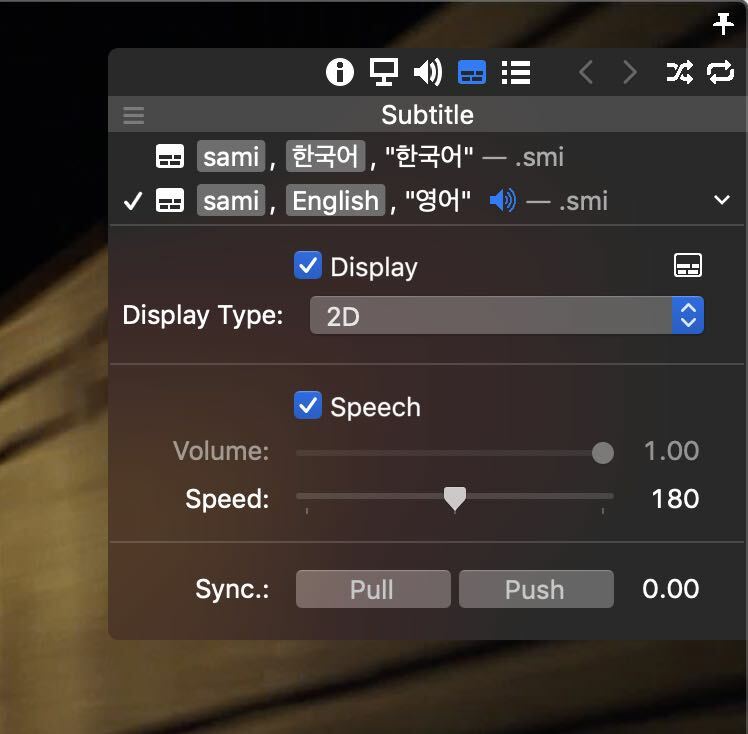 Subtitles can be just spoken without screen display, and you can control the speaking speed. You can also adjust the play/pause automatically according to the speaking speed. It would be great to use it for language study. Complex settings are not necessary. Just press the "Speech" button. 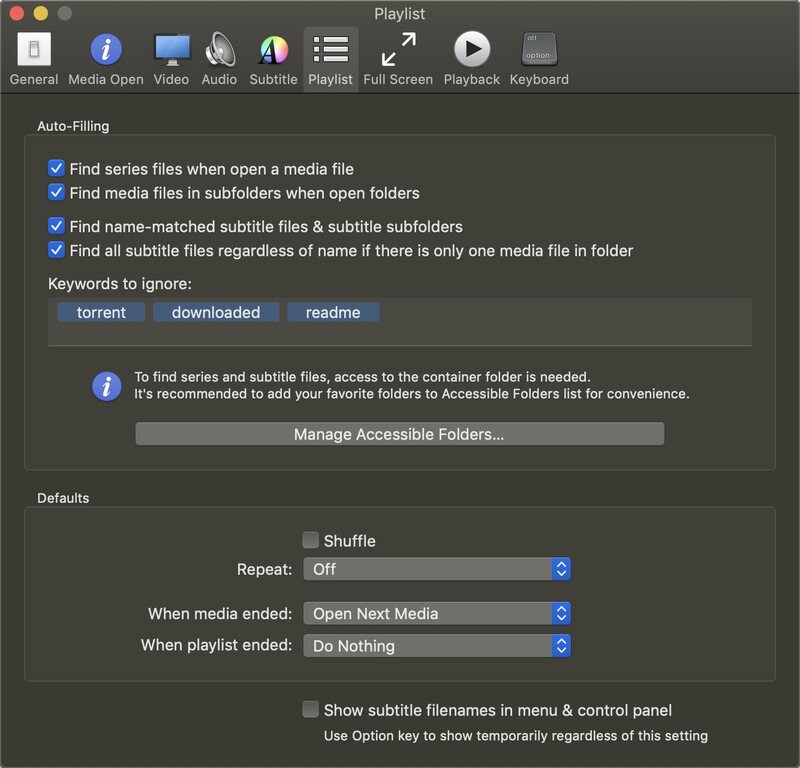 finds and fills the series and subtitle files in the same folder. You can also manually add and remove files. You can save the playlist and recall it later. You do not need to manage the playlist files. Movist manages all of them. Just give the playlist a name. Since 2016, the MacBook (Pro) no longer has an audio optical output jack. And most cheap USB audio devices do not support digital output on macOS. However, Movist supports digital output by itself in those devices, allowing the output of ac3, dts data as is. Please continue to use the existing optical output speakers. You can play music files. Enjoy with the album arts. More accurate colors including 10-bit color support. You can zoom, rotate, and flip the video. You can apply various CoreImage filters to the video. You can set the number of channels, delay, and digital output for each audio output device and set the default audio output device. Subtitles come out in 3D when viewing 3D movies. You can customize shortcut keys. 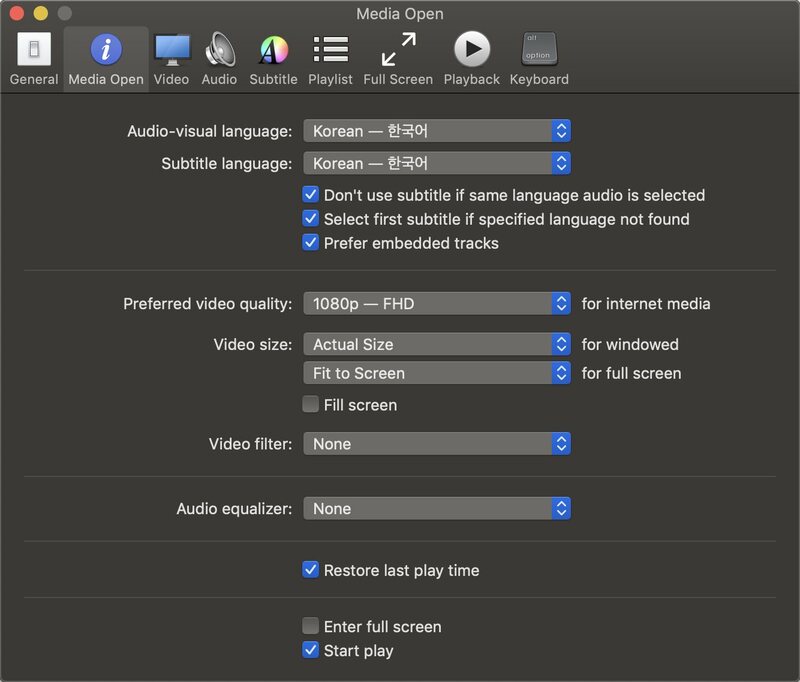 You can choose FFmpeg/QuickTime decoder.